For Mustang-loving fan boys, we're thinking the above first glimpse of the headlight design on the 2010 Ford Mustang is the equivalent of a celeb crotch-shot. So what can we tell from this new spy photo from KGP? Well, it looks like — well — like nothing Giugiaro made. Full report from the sneaky spies of KGP below. 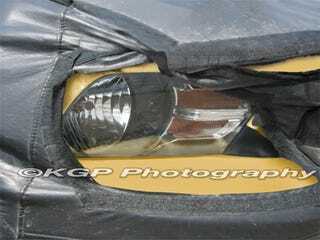 We just caught our first uncovered look at the headlight design destined for the 2010 Mustang. Past prototypes have hinted at a little chrome trim residing behind the headlight camouflage, and now we can see what was truly lurking behind the disguise. While the overall grille layout still appears to take some inspiration from the Giugiaro Mustang concept, it's now clear that the headlights are going their own, retro way.